I’ve said this before but I’m something of an oddity as a fan of the Filthy Tongues. Right age (probably) but I’m not someone who was more than aware of certain Goodbye Mr Mackenzie songs at the time. 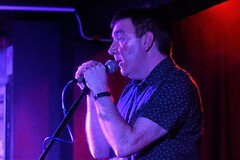 “I’d barely heard of headliners Isa & The Filthy Tongues prior to the show, never mind the Goodbye Mr Mackenzie connection, but they were excellent. I guess the closest acts that I can lazily lump them with are PJ Harvey and Sons and Daughters, they’ve got a similar swamp rock kind of vibe going on with a bit of Pixies thrown in. The first three songs provide a gradual intro to proceedings. They start with an instrumental and whilst I’m always a sucker for decent instrumentals this one grabs me right from the off. 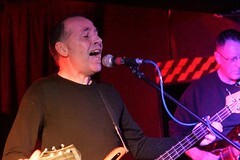 But puzzlingly there’s a huge gap on stage between Martin Metcalfe and bassist Fin Wilson. The gap isn’t filled for the second song as singer Stacy emerges from the wings to sit on a chair next to the corner of the stage to speak the lyrics. So it’s not until the third song that she actually gets on stage. Once there though she’s rivetting with her performance demanding your attention. In that guise I saw the band live a number of times and they also released two excellent albums and a live record. 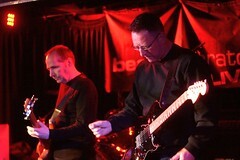 After a long silence two new songs, ‘Crewcut’ and ‘Lethe Walks’ (featuring Paul Hullah) appeared in the second half of 2014 and rather good they were too. But there’s been no further release and only the odd gig since. The album’s got a striking cover (at the top of the page) and interestingly it doesn’t feature either of the 2014 tracks. Which, taken with ‘Long Time Dead’, does suggest that it might well be rather good. Another album to add to 2016’s ever swelling roster.